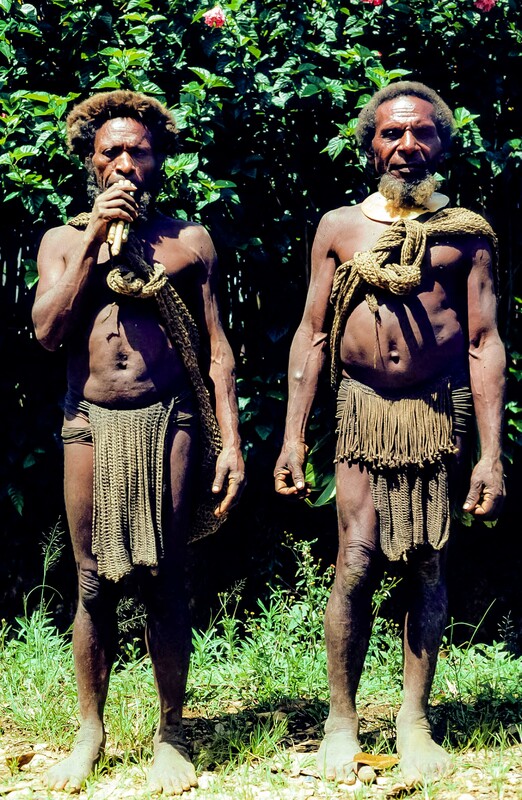 Papua New Guinea, Koroba, Two Wigmen, 1983 - The man on the left plays the Koroba Flute. They said it was used to attract girls. They also used it to amuse themselves while they walked, to avoid boredom. These men are examples of how fit most of the men are. Only the very elderly seemed debilitated. Most men were very strong as a result of constantly walking up and down the incredibly difficult topography of the Highlands of New Guinea. Their toes are splayed out. At first I thought their feet looked odd. Later, I realized that it was my feet that were unnatural, a result of wearing shoes. Their feet were how feet are supposed to be.